Both birds have been diligently incubating the four eggs even though the temperature is not as frigid since the north winds have stopped. It is hard to catch the eggs without a bird on top of them. 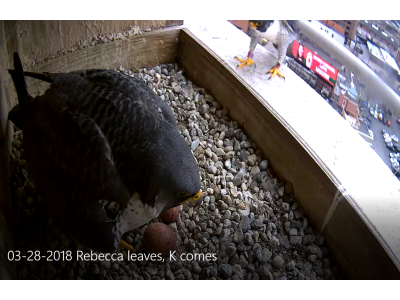 I caught a short video clip of the changeover between Rebecca and Kewpee about 12:30 PM. Rebecca very thoroughly turned and rearranged the eggs before Kewpee arrived to take a shift.